The skin of babies and kids is very sensitive and therefore shouldn’t be exposed to harsh chemicals used in everyday cosmetic products. There a a lot of substances you should watch out for when buying a shampoo for your kid or baby. They include Sodium Lauryl Sulfate (SLS), Parabens, Phthalates, Dyes, Synthetic Fragrances or Mineral oil derivatives. 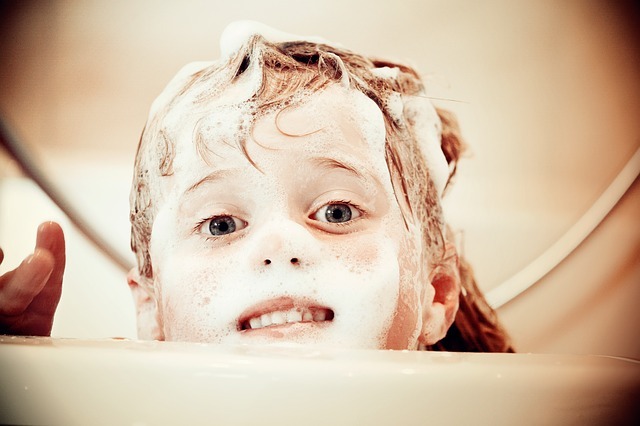 In this article we have put together a list of brands that have developed alternatives to conventional shampoos and use organic plant-based ingredients in order to gently clean your kid’s or baby’s delicate skin. The main substances you should watch out for are easy to spot on the list of ingredients: Parabens and SLS. Parabens are a common preservative found in shampoos, body wash and body lotions. They avoid bacteria to develop in liquids. However, parabens are endocrine disruptive chemicals that can influence the human hormonal system. Some Parabens have already been banned in countries like Denmark for the use in cosmetic products. You can easily identify them on the list of ingredients as Butylparaben, Propylparaben, Ethylparaben or Methylparaben. Sometimes their chemical names are used such as Butyl Hydroxybenzoate or Propyl Hydroxybenzoate. In the EU e.g. Butylparaben and Propylparaben are already on the danger list. SLS is another widely used chemical in shampoos and conditioners. Sodium Lauryl Sulfate (SLS) is a foaming agent but also a surfactant. That means it is also a chemical substance that reduces the surface tension in water. In terms of shampoo this characteristic is used to break up the natural oils on the skin and make it easier to wash and clean the skin. However, SLS is a harsh chemical and can cause skin irritations and dry skin. Fresh Monster Haircare Products from Denver, Colorado are specifically formulated for the needs of children. Their shampoos are 100% toxin-free with plant-based ingredients: No sulfates, parabens, phthalates, dyes, synthetic fragrances, BPA, gluten or soy. Made in the USA with no animal testing involved. Everyone Soap for Every Kid is made by EO Products from California. The soap is formulated to be used as shampoo, body wash and bubble bath. it consists of pure essential oils and plant based ingredients: Cruelty free, Paraben free, Polysorbate free, Disodium EDTA free, Gluten free, Sodium Laureth/Lauryl Sulfate free, non-GMO modified. JĀSÖN® was originally founded back in 1959. JĀSÖN means “healer” in Greek. Today the company offers a whole range of natural cosmetic products in the areas of facial, body, hair, sun and Oral care. Jason For Kids Only! Extra Gentle Shampoo is formulated with extra-mild botanical surfactants and certified organic extracts of Chamomile and Marigold. The shampoo has the same pH level as the tears from your kid’s eyes, therefor tear free! Fairy Tales haircare products from New Jersey are specifically formulated to prevent hair lice. The shampoo formulas are free of harsh chemicals, pesticides, toxins, parabens and sulfates. With the growing concern regarding children’s allergies, the products are also dairy, gluten and nut-free too. Puracy from Austin, Texas uses pure natural ingredients such as citrus grove, a light, subtle blend of pink grapefruit essential oils and 100% natural botanical extracts. This shampoo is suitable for all skin types, including those with eczema, cradle cap, and sensitive skin. No sulfates (SLS, SLES, SCS), triclosan, formaldehyde, salicylates, parabens, phosphates, SLS, SLES, MEA, DEA, TEA, petroleum-based ingredients, animal by-products, perfumes, dyes or caustics. No Parabens, No Phosphates, No Sulfates, Gluten-Free, vegan, gluten free, cruelty-free, Made in California, USA. Burt’s Bees from Oakland California is one of the Pioneers in all-natural and organic cosmetics. Their Baby shampoo and Body wash is tear free, pediatrician tested with no parabens, phthalates, petrolatum or SLS. The organic cosmetics company Weleda from Germany offers a wide range of organic cosmetics products including face and body care, children’s and baby care and pregnancy care. The Weleda Calendula Baby Shampoo and Body Wash uses hand harvested organic Calendula from Weleda’s Biodynamic gardens in Germany. It contains gentle surfactant made from coconut and sugar that lathers and cleanses without drying. Almond and sesame seed oils nourish skin and hair with vitamins and essential fatty acids. It is free of sulfates, parabens, phthalates and mineral oil derivatives. Tear free.